Our strength is built on more than 40 years, dedicated to personalised customer service and support, plus a passion for finding new ways to help science improve people’s lives. 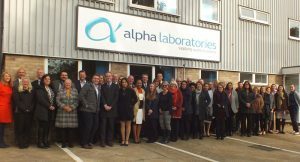 Alpha Laboratories is passionate about finding new ways to help science improve people’s lives through its evolving range of specialist diagnostic and laboratory products. From bowel cancer, IBS and IBD, to sickle cell anaemia; and from kidney disease to rheumatoid arthritis, Alpha Laboratories has for over 30 years been contributing to the health of the nation by providing quality, specialist diagnostic kits and controls to hospitals and healthcare professionals in the UK. Correct diagnosis is the first critical step that enables clinicians to take appropriate action in the treatment of their patients’ medical condition or disease. The type of diagnostic pathway taken can even play a role in contributing to the patient outcome, by speeding up the time to treatment or providing a less stressful method for analysis of the problem. Bowel cancer is the second leading cause of cancer deaths in the UK with over 16000 people dying from it each year. Regular screening has been shown to significantly reduce deaths and extensive national screening programmes are now underway in Scotland, Wales, England and Northern Ireland. Alpha Laboratories is the sole supplier of the bowel cancer test kits used for these four initiatives and is working closely with the programmes’ organisers to ensure their smooth and effective operation.